When it comes to managing the photo library on the iPhone the stock Photos app does the job pretty well. The app has been polished a lot over the past few years and now comes with additional tools that not only makes managing images easier but also enables users to edit them. Despite all its awesomeness the app still has some quirks that annoy iOS users. A new Cydia hack adequately called Simpler Photos fixes that thanks to its variety of customization options. For starters the Simpler Photos tweak lets you remove either the ‘Photos’ or ‘Albums’ tabs so you can access your images at one place. This gives the app a simpler and minimalistic look. Then it removes the super annoying ‘Deleted Photos’ section from the app, letting you delete images you no longer need at once. This means the pictures will not be stored in a folder for 30 days, ready to be recycled or viewed. 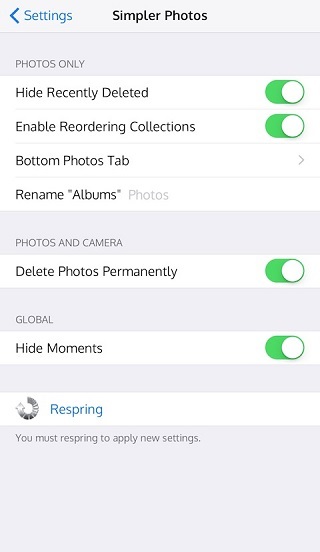 But that’s not all as Simpler Photos also allows users to reorder albums, disable the ‘Moments’ feature and more. After making changes you can respring the device directly from the preferences page. You can download the Simpler Photos tweak from Cydia for $0.99. It requires iOS 8 to run and can be configured from the Settings app.